Cheim & Read is pleased to announce an exhibition of new work by Barry McGee. This is the artist’s first solo show with the gallery. It will also be his first in New York in 8 years. 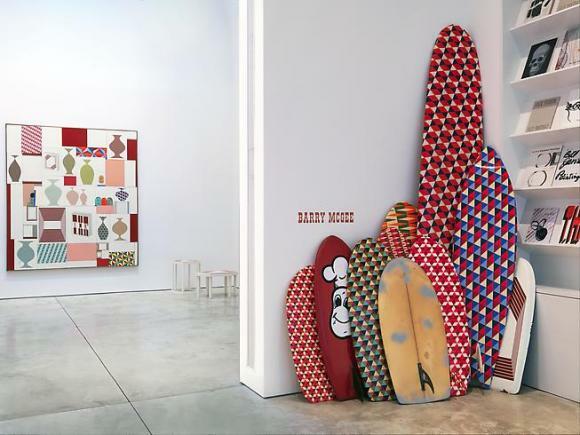 Born in 1966, Barry McGee is arguably the most well-known and influential of the recent surge of artists from the Bay Area to have international success. He was raised in San Francisco, studied painting and printmaking at the San Francisco Art Institute (graduating in 1991), and continues to live and work in the city. McGee’s boldly graphic, colorful work incorporates a multitude of influences (including, for example, graffiti, American folk art, and Op Art), but is most immediately evocative of the urban street culture from which he hails. Engaging the ways in which the city’s unique vernacular translates into artistic imagery, McGee celebrates the diversity, distinctive characters (one of his well-known motifs is a crawling, sad-sack bum), and neighborhood communities of the inner-city. His work critiques consumerist culture and the constant backdrop of commercialism in everyday interactions; rejecting the billboard and chain store, McGee instead finds inspiration in the seeming randomness of graffiti, the endless uploading of images on the internet, and the creative styling of misfits. McGee’s work succeeds in its sensitive balance between anarchy and collaboration, resulting in environments which immerse the viewer in his singular, yet inclusive, vision. Directly involved with the installations of his shows, McGee organizes his multi-layered compositions on-site. For the Cheim & Read exhibition, assembled clusters of framed drawings and hand-painted wood panels accompany loose stacks of embellished surfboards, fetish-like wooden objects, and specially-made furniture. Drawings, paintings and sculptures are treated equally; echoing his anti-establishment sensibility, McGee refuses hierarchies of material or subject matter. His recent work is comprised of flat-surfaced, brightly-colored geometric motifs, serial images and caricatures of cartoon-like characters, and recurring monikers, like the pseudonym “L. Fong,” and the acronyms “THR” (The Human Race or The Harsh Reality) and “DFW” (Down for Whatever). Interspersed among the abstract panels (which sometimes expand along bulbous walls and around corners en masse), the images and words provide an enigmatic but individualized narrative in an otherwise vibrating, tile-like field of intense pattern. Visually stimulating, perceptive, and seeming to channel the various rhythmic beats of urban culture, McGee’s work addresses issues of identity, mark-making, authorship and autonomy within the bustling, constantly changing tableau of city life. McGee has shown extensively, both nationally and internationally. “Mid-career Survey,” opened last year at the Berkeley Art Museum, Berkeley, California, and traveled to the Institute of Contemporary Art Boston, Boston, Massachusetts (where it closes September 2nd). An exhibition of new work, “2013 Focus: Barry McGee,” recently closed at the Modern Art Museum Fort Worth, Fort Worth, Texas. He has also been the subject of shows at UCLA Hammer, Los Angeles; the Prada Foundation, Milan; the Walker Art Center, Minneapolis; the Butler Gallery, Kilkenny Castle, Ireland; and The Watari Museum of Contemporary Art, Tokyo, among others. He is represented in New York by Cheim & Read.